The prices in this deal round up were accurate as of 2019-04-07 07:38 EST. The prices may have changed since then. 45% OFF PROGEAR Dual Action 360 Multi-Direction 36″ Stride Air Walker LS with Heart Pulse Sensors: You can get this for only $109.99 here and it’s normally $199.99 at Walmart. 50% OFF Umbra Prisma Wall Decor, Set of 6, Copper: You can get this for only $15.00 here and it’s normally $29.72 at Amazon. 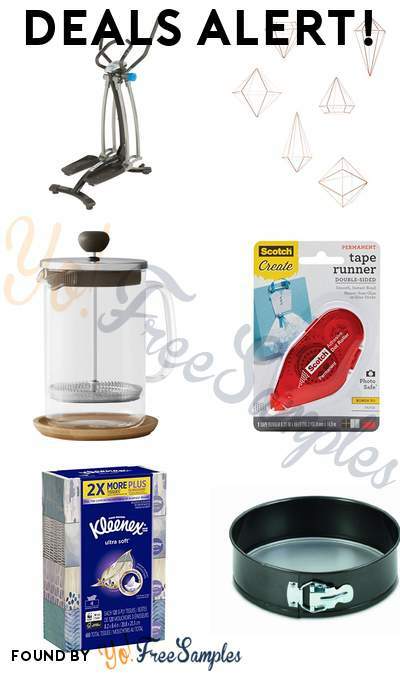 66% OFF Caribou Coffee – 5-Cup French Press – Clear: You can get this for only $9.99 here and it’s normally $29.99 at Best Buy. 66% OFF Scotch Tape Runner, Red Dispenser .31 in x 16.3 yd (055-CFT): You can get this for only $2.78 here and it’s normally $8.25 at Amazon. 62% OFF Kleenex Ultra Soft Facial Tissue Regular (Pack of 4), 120 count Each, 3 ply, White: You can get this for only $5.99 here and it’s normally $15.99 at Amazon. 67% OFF Cuisinart AMB-9SP 9-Inch Chef’s Classic Nonstick Bakeware Springform Pan, Silver: You can get this for only $8.49 here and it’s normally $26.00 at Amazon. 50% OFF Webroot Internet Security Complete + Antivirus 2018 (5-Devices) (1-Year Subscription) – Android|Mac|Windows|iOS [Digital]: You can get this for only $39.99 here and it’s normally $79.99 at Best Buy. 60% OFF Internet Security (3-Devices) (1-Year Subscription) – Windows [Digital]: You can get this for only $19.99 here and it’s normally $49.99 at Best Buy. 50% OFF Titan Quest – Nintendo Switch: You can get this for only $19.99 here and it’s normally $39.99 at Best Buy. 66% OFF This Is the Police 2 – Nintendo Switch: You can get this for only $9.99 here and it’s normally $29.99 at Best Buy. 66% OFF This Is the Police Standard Edition – Nintendo Switch: You can get this for only $9.99 here and it’s normally $29.99 at Best Buy. 66% OFF Legend of Kay Anniversary – Nintendo Switch: You can get this for only $9.99 here and it’s normally $29.99 at Best Buy. 66% OFF The Raven Remastered – Nintendo Switch: You can get this for only $9.99 here and it’s normally $29.99 at Best Buy. 50% OFF Crayola – Globbles (3-Pack): You can get this for only $2.49 here and it’s normally $4.99 at Best Buy. 50% OFF ZEISS – VR One Plus Virtual Reality Headset – white: You can get this for only $29.99 here and it’s normally $59.99 at Best Buy. 49% OFF Ashley Furniture Signature Design – Darcy Sleeper Sofa – Full Size – Ultra Soft Upholstery – Contemporary – Cafe Brown: You can get this for only $529.22 here and it’s normally $1,052.99 at Amazon. 50% OFF Wolfenstein II: The New Colossus – Windows: You can get this for only $19.99 here and it’s normally $39.99 at Best Buy. 53% OFF Uttermost 26280-1 Rodeshia Modern Lamp, Champagne: You can get this for only $101.81 here and it’s normally $217.80 at Amazon. 52% OFF Uttermost 26589-1 Catalan Metal Accent Lamp, Brown: You can get this for only $128.82 here and it’s normally $272.80 at Amazon. 76% OFF Uttermost 29927-1 Bashan Lamp, Nickel Plated Water Glass, 32.0″ L x 9.5″ W x 11.0″ D Polished: You can get this for only $46.54 here and it’s normally $195.80 at Amazon. 49% OFF CorLiving DSH-490-T Dillon Dining Table Cappuccino: You can get this for only $376.00 here and it’s normally $739.00 at Amazon. 74% OFF Kenroy Home 32070CRD Onoko Table Lamp: You can get this for only $38.00 here and it’s normally $146.16 at Amazon. 50% OFF Lite Source LS-22720GOLD Poppy Table Lamp, 6″ x 6″ x 20.5″, Chrome, Gold: You can get this for only $40.06 here and it’s normally $81.00 at Amazon. 47% OFF Kenroy Home 21430CH Table Lamp Chrome: You can get this for only $49.99 here and it’s normally $95.40 at Amazon. 65% OFF Lite Source LS-22720RED Poppy Table Lamp, 6″ x 6″ x 20.5″, Chrome, red: You can get this for only $28.05 here and it’s normally $81.00 at Amazon. 45% OFF LG – 24″ IPS LED FHD FreeSync Monitor – Black: You can get this for only $109.99 here and it’s normally $199.99 at Best Buy. 47% OFF Kenroy Home 32070PWH Onoko Table Lamp, 31″H, Pearlized White Finish: You can get this for only $76.39 here and it’s normally $146.16 at Amazon. 41% OFF VTech VM5261 5” Digital Video Baby Monitor with Pan & Tilt Camera, Wide-Angle Lens and Standard Lens, White: You can get this for only $100.00 here and it’s normally $169.95 at Amazon. 50% OFF Trials Rising – Xbox One Gold Edition: You can get this for only $19.99 here and it’s normally $39.99 at Amazon. 66% OFF NBA 2K19 – Xbox One: You can get this for only $19.80 here and it’s normally $59.99 at Amazon. 43% OFF Solo Macdougal 17.3 Inch Rolling Laptop Case, Black: You can get this for only $84.99 here and it’s normally $149.99 at Amazon. 47% OFF Creme of Nature 100% Pure Argan Oil, 1 Ounce: You can get this for only $4.69 here and it’s normally $9.00 at Amazon. 55% OFF Marvel – Track Set – Styles May Vary: You can get this for only $4.49 here and it’s normally $9.99 at Best Buy. 50% OFF Bella – Pro Series 6-Slice Toaster Oven – Black stainless steel: You can get this for only $49.99 here and it’s normally $99.99 at Best Buy. 57% OFF Funko – Mystery Mini: Rick and Morty Series 2 – Blind Box – Styles May Vary: You can get this for only $2.99 here and it’s normally $7.00 at Best Buy. 55% OFF Funko – Stranger Things SuperCute Plush – Styles May Vary: You can get this for only $4.49 here and it’s normally $9.99 at Best Buy. 50% OFF Epson – Bright White Paper – White: You can get this for only $4.49 here and it’s normally $8.99 at Best Buy. 57% OFF Marvel – Marvel Black Panther Vibranium Power FX Claw: You can get this for only $8.49 here and it’s normally $19.99 at Best Buy. 71% OFF Astro Gaming – ASTRO A10 Wired Stereo Gaming Headset – Legend Of Zelda: You can get this for only $20.00 here and it’s normally $69.99 at Best Buy. 66% OFF WWE 2K19 – PlayStation 4: You can get this for only $19.99 here and it’s normally $59.99 at Best Buy. 41% OFF Blink – Add on XT Indoor/Outdoor Home Security Camera for Existing Blink Customer Systems – Black: You can get this for only $69.99 here and it’s normally $119.99 at Best Buy. 41% OFF Add-on Blink XT Home Security Camera for Existing Blink Customer Systems: You can get this for only $69.99 here and it’s normally $119.99 at Amazon. 45% OFF SHILLS Original Black Mask, Peel Off Mask, Removes Black Heads, Prevents Acne, Shrink Pores. Charcoal Mask, Blackhead Peel Off Mask (50 ML): You can get this for only $10.99 here and it’s normally $19.99 at Amazon. 62% OFF Zebra M/F 301 Stainless Steel Mechanical Pencil and Ballpoint Pen Set, Fine Point, 0.5mm HB Lead Pencil and 0.7mm Black Ink Pen, 2-Count: You can get this for only $2.00 here and it’s normally $5.38 at Amazon. 47% OFF Fisher-Price Nickelodeon Sunny Day, Sunny’s Hair Dryer Kit: You can get this for only $5.23 here and it’s normally $9.99 at Amazon. 50% OFF CHEFMAN – 6-Tray Food Dehydrator – Black: You can get this for only $89.99 here and it’s normally $179.99 at Best Buy. 43% OFF Michael Kors – Access Runway Smartwatch 41mm Stainless Steel – Gold Stainless Steel: You can get this for only $199.00 here and it’s normally $350.00 at Best Buy. 58% OFF CHEFMAN – 2.5L Analog Air Fryer – Black: You can get this for only $49.99 here and it’s normally $119.99 at Best Buy. 43% OFF Blink XT Home Security Camera System – 3 Camera Kit with Echo Dot (3rd Gen): You can get this for only $209.99 here and it’s normally $369.98 at Amazon. 50% OFF Umbra Ribbon Modern 12-inch Wall Clock, Battery Operated Quartz Movement, Silent Non Ticking Wall Clock, Stainless Steel: You can get this for only $20.00 here and it’s normally $40.00 at Amazon. 44% OFF Brondell Bidet â€“ Thinline Dual Nozzle SimpleSpa SS-250 | Fresh Water Spray |Non-Electric | Bidet Toilet Attachment in White | SafeCore Internal Valve | Nozzle Guard | Easy to Install: You can get this for only $27.99 here and it’s normally $49.99 at Amazon. 88% OFF Mead Subtraction Flashcards, 55 Cards, Grades K-3 (63040): You can get this for only $0.35 here and it’s normally $3.12 at Amazon. 57% OFF Good Cook Stainless Steel Kitchen Sink Strainer: You can get this for only $1.40 here and it’s normally $3.29 at Amazon. 63% OFF Calico Critters Hopscotch Rabbit Grandparents: You can get this for only $7.30 here and it’s normally $19.99 at Amazon. 81% OFF PARWIN PRO 1 Inch Flat Iron for Hair with PTC Heating Temperature Control Professional Hair Straighten for All Hair Types Black: You can get this for only $18.99 here and it’s normally $99.99 at Amazon. 42% OFF Arlo Lights – Smart Home Security Light | Wireless, Weather Resistant, Motion Sensor, Indoor/Outdoor, Multi-colored LED| 2 Light Kit (ALS1102) camera not included: You can get this for only $144.62 here and it’s normally $249.99 at Amazon. 50% OFF The North Face Women’s Insulated Ancha Parka II – TNF Black – L: You can get this for only $99.50 here and it’s normally $199.00 at Amazon. 80% OFF UPSKY Cat Toy Roller Cat Toys 3 Level Towers Tracks Roller with Three Colorful Ball Interactive Kitten Fun Mental Physical Exercise Puzzle Toys: You can get this for only $5.99 here and it’s normally $29.99 at Amazon. 50% OFF Fisher-Price Little People Travel Together Friend Ship: You can get this for only $14.99 here and it’s normally $29.99 at Amazon. 60% OFF HDTV Antenna Indoor, Sotek HD TV Antenna for Digital TV Indoor 50-80 Miles Long Range with Detachable Amplifier and 10FT High Performance Coax Cable – Black: You can get this for only $19.99 here and it’s normally $49.99 at Amazon. 50% OFF MEIGO Dinosaur Toys – Toddlers STEM Learning Take Apart Toys Construction Engineering Building Play Set for Kids 3 4 5 6 Year Old Boys Girls (5 Pack): You can get this for only $29.99 here and it’s normally $59.99 at Amazon. 58% OFF Westcott All Purpose Value Stainless Steel Scissors, 8″, Red: You can get this for only $2.39 here and it’s normally $5.75 at Amazon. 50% OFF Planters Roasted Pecans, 7.25 oz Canister: You can get this for only $5.98 here and it’s normally $11.97 at Amazon. 42% OFF FINIGE Handheld Bidet Sprayer for Toilet Cloth Diaper Sprayer (Two Ways to Mount) Portable Pet Shower Toilet Water Sprayer Seat Bidet Attachment Bathroom Stainless Steel Spray for Personal Hygiene: You can get this for only $28.98 here and it’s normally $49.99 at Amazon. 78% OFF Speed Stick Antiperspirant/Deodorant, Fresh Scent, 3 Ounce Stick: You can get this for only $0.95 here and it’s normally $4.39 at Amazon. 57% OFF Tree Hut 24 Hour Intense Hydrating Shea Body Butter Tropical Mango, 7oz, Hydrating Moisturizer with Pure Shea Butter for Nourishing Essential Body Care: You can get this for only $3.82 here and it’s normally $8.99 at Amazon. 42% OFF KOHLER K-596-CP Simplice High-Arch Single-Hole or Three-Hole, Single Handle, Pull-Down Sprayer Kitchen Faucet, Polished Chrome with 3-function Spray Head, Sweep Spray and Docking Spray Head Technology: You can get this for only $175.99 here and it’s normally $306.10 at Amazon. 65% OFF Sabrent USB Bluetooth 4.0 Micro Adapter for PC [v4.0 Class 2 with Low Energy Technology] (BT-UB40): You can get this for only $6.99 here and it’s normally $19.99 at Amazon. 85% OFF Mainstays Lightweight Handheld Steam Iron: You can get this for only $4.50 here and it’s normally $32.00 at Walmart. 49% OFF • Dual Electronics DXDM280BT Multimedia LCD High Resolution Double DIN Car Stereo Receiver with Built-In Bluetooth, CD, USB, MP3 & WMA Player: You can get this for only $29.99 here and it’s normally $59.87 at Walmart. 49% OFF Burt’s Bees 5-Pc. Travel Essentials Set: You can get this for only $7.50 here and it’s normally $14.99 at Macys. 62% OFF DKNY Men’s Mixed Media Puffer Bomber Jacket, Created for Macy’s: You can get this for only $93.99 here and it’s normally $250.00 at Macys. 80% OFF Lauren Ralph Lauren Men’s Classic-Fit Ultraflex Stretch Brown Solid Vested Suit: You can get this for only $129.99 here and it’s normally $650.00 at Macys. 79% OFF Tommy Hilfiger Men’s Modern-Fit THFlex Stretch Black Twill Vested Suit: You can get this for only $108.99 here and it’s normally $525.00 at Macys. 60% OFF American Rag Men’s Hooded Denim Jacket, Created for Macy’s: You can get this for only $28.00 here and it’s normally $70.00 at Macys. 75% OFF Tommy Hilfiger Men’s Boris Colorblocked Sweatshirt: You can get this for only $23.96 here and it’s normally $99.00 at Macys. 81% OFF Van Heusen Flex Men’s Slim-Fit Suits: You can get this for only $74.99 here and it’s normally $395.00 at Macys. 65% OFF Goodful Titanium Ceramic Non-Stick 11″ Fry Pan: You can get this for only $9.93 here and it’s normally $28.99 at Macys. 65% OFF The Cellar 12-Pc. Coupe Set, Created for Macy’s: You can get this for only $39.99 here and it’s normally $117.00 at Macys. 69% OFF Kenneth Cole Reaction Men’s Techni-Cole Slim-Fit Brown Pindot Suit: You can get this for only $119.99 here and it’s normally $395.00 at Macys. 49% OFF Milwaukee M18 FUEL 18-Volt Lithium-Ion Brushless Cordless 7-1/4 in. Circular Saw Kit w/ (1) 9.0Ah Battery, (1) 24T Blade, Charger: You can get this for only $249.00 here and it’s normally $489.00 at Home Depot. 42% OFF Gorilla Ladders 3-Step Lightweight Steel Step Stool Ladder with 225 lbs. Load Capacity Type II Duty Rating: You can get this for only $19.98 here and it’s normally $34.98 at Home Depot.